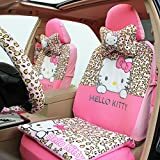 This Universal Hello Kitty Car Front and Rear Seat Covers and Accessories(15PCS) will include : 2*Front seat headrest covers; 2*Front seat neck pillows; 2*Front seat back covers; 2*Front seat seat covers; 1*Wheel cover; 2*Safety belt covers; 2*Rear seat back covers; 1*Rear seat handrest cover; 1*Rear seat seat covers; 1*seat cushion. All items you see in the picture will include as above. Universal design, fit for all Five Seats cars. Classic hello kitty leopard pattern design, bring your car with love and care!